This meal was served to Dave and Mary Ballantyne in the new kitchen February 15, 2012 with thanks and gratitude to Dave for his contribution to the massive undertaking. You can replace the fish with another white fleshy variety, like cod, and the sake with white wine. The presentation is a show stopper. sake or white wine - ½ c.
soy sauce - 1 ½ tbsp. grated peeled ginger - 1 tsp. sliced spring garlic (or scallions) - ½ c.
1) Preheat oven to 400F with a baking sheet on bottom rack. 2) Stir together sake, soy sauce, ginger and sugar in bowl. 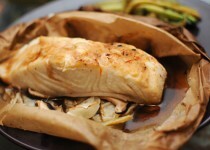 3) Put a fish fillet in centre of each parchment square and season with ¼ tsp. salt total. 4) Working with one piece of fish at a time, sprinkle fish with some of the scallions and spoon some of sake mixture over top (hold 2 corners of parchment to prevent liquid from running off). Gather sides of parchment up over fish to form a pouch, leaving no openings and tie tightly with string. 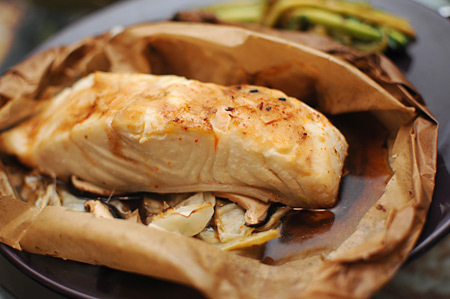 5) Bake on hot baking sheet until fish is just cooked through, 10-12 minutes. 6) Serve with steamed white rice and sauteed garlic scapes (or green beans). Tip: Do a quick blanch of your garlic scapes to bring out the colour. The flavour will be milder. Saute with olive oil, coarse sea salt and squeeze of fresh lemon or lime juice.